Get compensated instantly for cancellations made by both Driver-Partners and Passengers! Remember the improved cancellation feature? Now it’s way better! Bear in mind that the weekly quota of 6 cancellations still applies, and any cancellation that affects your CR will not result in a compensation. Everything’s done automatically now! 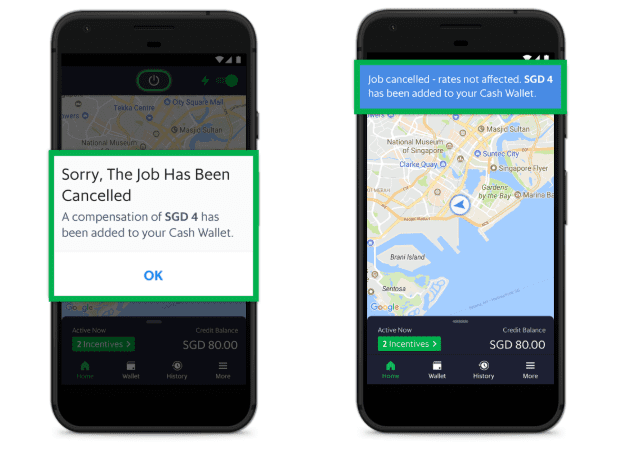 When you cancel the trip, or when passengers cancel after 5 minutes*, the $4 compensation will be added immediately into your Grab Driver app Cash Wallet. The compensation will also be reflected in your job history and weekly Partner Statement. *If you take too long, i.e not travelling at the average distance that should have been covered within 5 minutes, or do not travel towards the passenger, the compensation is not applicable even if the passenger cancels after 5 minutes. To enjoy the feature, please ensure that you’re on Grab Driver app v5.49.0 (Android) / v1.36.0 (iOS) or above. Q: Who is eligible for this compensation? A: This is applicable to all active GrabCar and GrabTaxi Driver-Partners. Q: What happens if I accept a booking, but the passenger cancels after 5 minutes? A: Yes, we know this is frustrating as well, and you will also receive a $4 compensation for that. While it was credited weekly previously, effective 1st October 2018 the compensation will be instantly credited to your cash wallets. Q: Why am I not compensated when a Passenger cancels 5 minutes after I have accepted the booking? You might have taken too long to reach the passenger i.e not travelling at the average distance that should have been covered within 5 minutes. You did not travel towards the passenger. Q: Who pays for this cancellation compensation? A: Currently, this cancellation compensation comes from Grab and will be paid automatically into your Cash Wallet.